Tamil Nadu Governor Thiru. 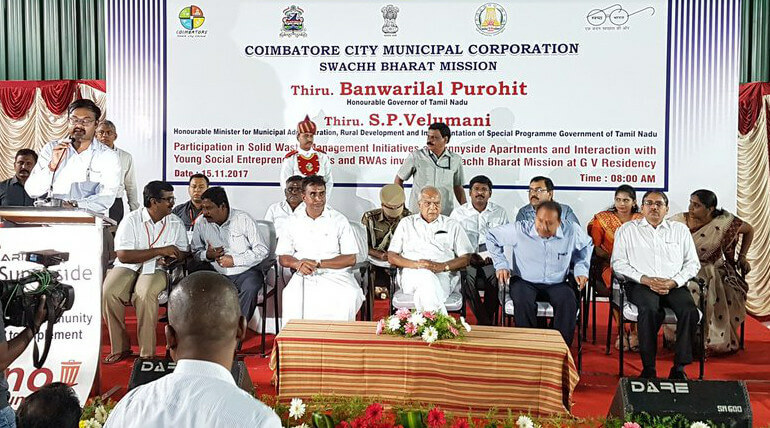 Banwarilal Purohit today on 15th Nov visits Sunnyside Apartment in Coimbatore that is maintaining proper waste management. The apartment is situated at Peelamedu area which has about 250 families. It is near National Model School in Fun Mall Road at Peelamedu. The president of the apartment Mr. Senthil who happened to see the waste management in Coimbatore airport wanted to implement the same method in his apartment and it was carried out by Mrs. Rupa. She had talked to every resident in the apartment and slowly implemented it in action. Now the whole living apartment is following proper garbage collection. The garbage are divided into 3 categories that are collected in 3 different bags. The bio-degradable waste like food, vegetables and fruit waste are collected in Green color basket; paper, wood and other recycling waster are collected in white basket while plastics are collected in red basket. The residents say this method of collecting waste is easy for us to maintain and also it makes easy way for our corporation workers to dispose it. It also makes our whole apartment to feel great and shine. This is the first time TN governor is visiting the residential area and praising them for their socially beneficial cause. Banwarilal Purohit praised the team work of the apartment and said this will be an example for others and hope everyone follow this in every house. Governor also visited Coimbatore bus stand and talked about Swachh Bharat. He had review bio-toilet project there and addressed the event. He said as Coimbatore had been selected for smart city it will have quick and vast development.